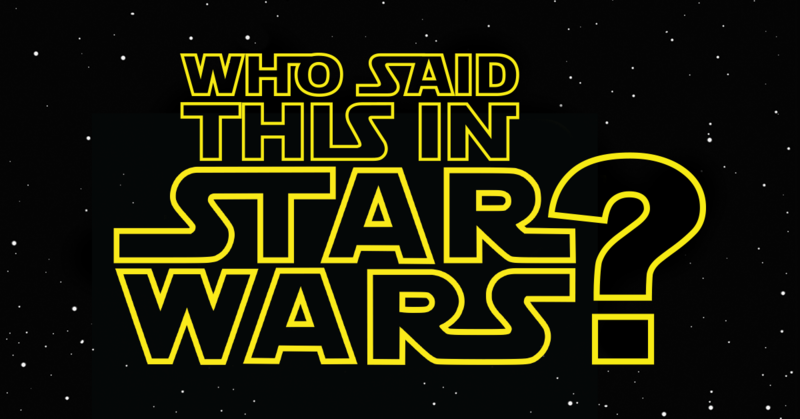 H&I | Who said this in Star Wars? Who said this in Star Wars? Those of of us who grew up loving Star Wars — and we're talking the original film from 1977 here — have watched the movie countless times. We quote lines from the script in our everyday lives. Still, funny thing is, even if you can shout out every line and you sit and watch, quizzes like this can be tricky. We gathered some of the most memorable lines from that first film — and we're talking the original original before the added scenes here. So, is the Force with you? Try and get through this Kessel Run of trivia questions. "I regret that I am unable to present my father's request to you in person." "But I was going into Tosche Station to pick up some power converters!" "These aren't the droids we're looking for." "Your powers are weak, old man." "The Jedi are extinct, their fire has gone out of the universe." "He has too much of his father in him." "He has no time for smugglers who drop their shipments at the first sign of an Imperial cruiser." "Into the garbage chute, fly boy." "Don't call me a mindless philosopher, you overweight glob of grease." "That wizard is just a crazy old man." "Uh, we had a slight weapons malfunction, but uh... everything's perfectly all right now. We're fine. We're all fine here now, thank you. How are you?" "Mos Eisley spaceport: You will never find a more wretched hive of scum and villainy."